Andon cords are a fixture in modern auto factories, draped over lines like Christmas tinsel. TOYOTA CITY, Japan -- Toyota is retiring the "andon cord," the emergency cable strung above assembly lines that came to symbolize the built-in quality of the Toyota Way and was widely copied through the auto industry and beyond. In its place are yellow call buttons perched waist-high within easy reach along the line for workers to hit when a problem pops up requiring help or the line to be stopped. Toyota switched to the buttons last year at its flagship Tsutsumi assembly plant in Toyota City, during a factory renovation. In Japan, the buttons were first used by a vehicle-assembling subsidiary, Toyota Motor East Japan, at a Miyagi plant. Andon cords are a fixture in modern auto factories, draped over lines like Christmas tinsel. The idea: Workers pull the cord to alert co-workers when a problem crops up so they can get help. If the glitch persists, workers may even stop the line to troubleshoot. The cords are essential to Toyota's concept of built-in quality, or catching problems before they head down the line and are cemented in place in a completed vehicle. That function won’t be lost with the buttons, but cutting the cords will change the factory landscape. And that is exactly the goal, under a concept called blue-sky factories. Toyota’s manufacturing gurus want to cut the clutter over the workspace, creating a sort-of blue sky, for a couple reasons. First, it creates a less oppressive, more comfortable, open-air work environment. Second, there are safety and efficiency benefits because there is less overhead to snag long, cumbersome components or tools. Also, the buttons operate wirelessly, meaning they can be moved around and positioned within reach. Moreover, the wireless buttons can be added to existing plants, which can reconfigure old lines and design new ones without worrying about where and how to string the old cord. The buttons are expected to be added to other plants, though the shift may be slow. They are already used at select overseas subsidiary plants in China, Thailand and Indonesia. The sprawling Tsutsumi plant, which has annual capacity for 372,000 vehicles and makes the Prius, Camry and Scion tC, among others, is a petri dish for new manufacturing ideas. The roof is covered with solar panels generating about half of the electricity it needs to operate. And the outside walls are coated in photocatalytic paint that breaks down nitrogen oxide and other air pollutants. 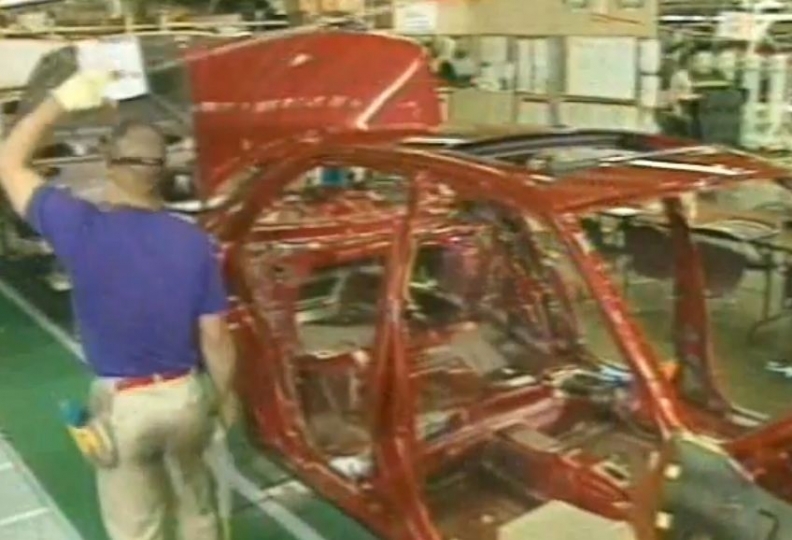 Inside, the 44-year-old Tsutsumi plant also pioneered Toyota’s use of a so-called three-wet paint shop. That saves energy by applying multiple layers of wet paint onto a vehicle without having to dry the paint in between.